Bailee made her USA debut at Denver International Airport last Saturday. I had to wait until today to meet her for the first time and couldn't resist the opportunity to snap a few pictures. 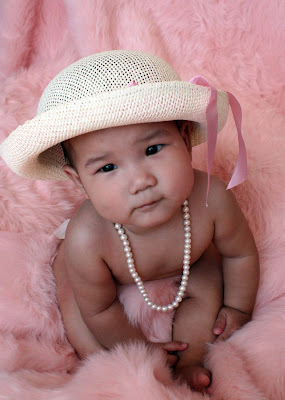 It's my personal belief that there's no such thing as an ugly Asian baby, and Bailee is certainly no exception. Welcome to America little girl. It is SO NOT OK that YOU got to hold MY niece before I got to!!!! But other than that, these photos are just BEAUTIFUL. You have done a great job! Great photos, and a darling baby! OK, that was not supposed to get out! By the way Kris got lucky since Emi was holding her and I was in the bathroom. I guess sometimes you get lucky...I certainly did!!!! What's up with the name of this blog? VERN - President of the Mediocrity Club and author of this blog. I grew up on Star Search and Tom Selleck, and count Chipotle as a food group. CORY- the guy who said that even if I insisted on squeezing the toothpaste from the middle, he would still like to share a bathroom with me. For the rest of our lives.